In Japanese Animation, Sleep Is Frequently Indicated Not With “Zzzz”s But? Remember that time when you fell asleep and blissfully blew massive snot bubbles out of your nose while slumbering away? No? Well then, clearly you’re not a sleepy anime character. The whole slumbering-snot-bubble bit is a particular trope you’ll rarely, if ever, see in Western animation, but appears quite often in Japanese animation. 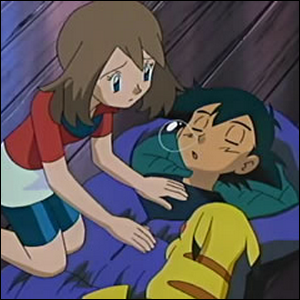 The image seen here, captured from an episode of Pokémon, is a perfect illustration, if you’ll pardon the pun, of the phenomenon where sleep is indicated not by floating “Zzzz”s (as it often is in Western animation), but by a rhythmically inflating and deflating bubble. Although seen as gross by Western viewers, the representation is perceived as cute by Japanese viewers. Image courtesy of The Pokémon Company International.